The databases below are collections of streaming music that in most cases CANNOT be downloaded. CD-quality streaming access to more than 4,000 albums from 42 independent record labels. CRI, New World Records, Albany, Innova, Cedille, XI, Pogus, Deep Listening, Lovely Music, and more. The focus is on contemporary classical American music. Other styles represented include folk, Native American, jazz, early rock, musical theater, and contemporary electronic. Provides streaming access to hundreds of concerts from the Berlin Philharmonic. Requires creation of free personal account; see "More info" for details. Digital Concert Hall provides streaming access to hundreds of concert videos from the Berlin Philharmonic, covering all periods of musical history. New concerts are added every week and more than 40 live-streams are offered every year. The site also includes artist interviews and documentaries. In order to use this resource, users must first register and create an account while on the campus network. After that users can access the resource from anywhere by logging in to their personal accounts. Streaming access to more than 600,000 audio tracks of American music. songs by and about American Indians, miners, immigrants, slaves, children, pioneers, and cowboys. Included in the database are the songs of Civil Rights, political campaigns, Prohibition, the Revolutionary War, the Civil War, anti-war protests, and more. The range of genres includes country, folk, bluegrass, Western, old time, American Indian, blues, gospel, shape note singing, doo-wop, Motown, R&B, soul, funk, and others. Labels include Rounder Records, Appleseed Recordings, Stax, Specialty Records, Testament Records, McNeil Music, Native Ground Music, Rebel Records, County Records, Smithsonian Folkways, Document Records, and more. Streaming audio of contemporary music from around the world. Includes reggae, worldbeat, neo-traditional, world fusion, Balkanic jazz, African film, Bollywood, Arab swing and jazz, and other genres such as traditional music - Indian classical, fado, flamenco, klezmer, zydeco, gospel, gagaku, and more. Audio files of wide range of popular music from around the world. Includes hundreds of thousands of tracks from major genres in pop music, including alternative, country, Christian, electronic, hip-hop, metal, punk, new age, R&B, reggae, rock, soundtracks, and many more. High-quality films of full-length performances by some of today’s most provocative artists working in dance, theater, and music. OntheBoards.tv is an on-demand website for HD-quality contemporary performance films available for streaming, download or mobile viewing. This first-of-its-kind site brings contemporary work to a wider public by filming top caliber performances with multiple high-definition cameras, editing the film collaboratively with the artists, and delivering them online as feature-length performance films. Filmed at On the Boards, as well as in peer theaters across the country, the performances present a snapshot of the best new works by current leaders in dance, theater, and music. The films consist of compelling international and northwest contemporary performance, including works by artists who are rarely seen in the US and works that will never be performed again. Find class projects and performances from MUS 145: Mainstream Music Writing. The library also has a collection of music CDs in the genres of classical, jazz, and some rock. They are located on the third floor of the library and shelved next to the Children's Literature section, behind the reference desk. CDs can be checked out for one week and only faculty and grad students can renew them at the circulation desk. 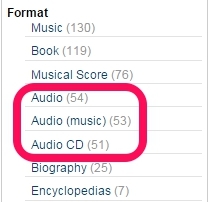 To search for CDs owned by the library, use the library catalog box below. On the results page you can limit to Audio (recording on the left side of the screen).